A varicocele is the dilation of the veins of the pampiniform plexus that drain the testicles. Normally, the backward blood flow is prevented by small one-way valves in the veins. Congenital valve abnormalities or vein compression by adjacent structures can cause vein dilation. This vein dilation may cause an increase in the temperature of the testicles, thus decreasing sperm production and testosterone production. The exact pathophysiology of varicocele and its impact on male reproductive potential has been debated for the last 50 years. Varicocele is still one of the most controversial issues in the field of male infertility, especially regarding why, when and to whom treatment should be applied. How common is a Varicocele? Varicoceles are identified in approximately 7% of prepuberal and 10-25% of postpuberal males. In older men, varicoceles can be identified in up to 43% of individuals. Prevalence of a varicocele increases over time, and it is estimated that a 10% rise in incidence occurs for each decade of life. It is identified in approximately 20-35% of men with infertility. The higher frequency of varicoceles in both the elderly and in men with infertility suggests that it is a progressive disease. There are several theories. One concept is that the presence of these dilated veins around the testicle creates a higher temperature environment than what is optimally required by the testicles. This leads to a quantitative and qualitative decrease in sperm production and testosterone production. For patients who have infertility, low testosterone levels or pain, surgical correction may be an option. 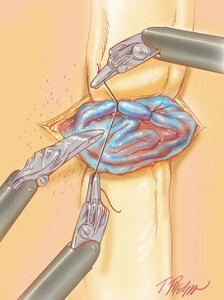 Randomized control trials have now shown that sub-inguinal microsurgical varicocelectomy may provide a higher success rate than abdominal laparoscopic approaches and embolization techniques. Previous studies by Shu et al. have shown some potential benefits to robotic assisted microsurgical sub-inguinal varicocelectomy. Our center is one of the leading pioneers in robotic assisted microsurgical sub-inguinal varicocelectomy (we have performed well over 1,000 robotic microsurgical procedures). What are the outcomes after robotic sub-inguinal microsurgical varicocelectomy? In our recent patient series of over 250 cases over the last few years, 70% of our patients who had low sperm counts achieved a statistically significant improvement in sperm count and/or motility, and 19% of patients who had azoospermia (no sperm in their ejaculate) started to produce sperm. Over 90% of patients who had pain had a significant reduction in their pain levels (based on the PIQ-6 score from RAND – an externally validated pain impact scoring system).